For all the work its elaborate grading process entails, the Michelin Guide is parsimonious when reviewing restaurants, allotting its treasured stars sparingly to a select few. Eighty-one restaurants from around the world currently have the distinction of holding three stars, which the Guide merely mentions as denoting a place with “exceptional cuisine, worth a special journey”. Because of its location, getting to the French Laundry necessitates a special journey. It seems strange that a restaurant stuck in a rustic town called Yountville, smack in the middle of Napa Valley and two hours’ drive from most of the Bay Area managed to become what’s regarded by many to be America’s finest restaurant. In addition to the journey, some forward planning is required, as the Laundry only takes booking up to two months in advance. Dinner bookings are usually in such demand that each day’s 60 or so seats are snapped up within minutes of the reservation line opening each morning. Lunch bookings are a little easier to come by. In March, after getting a busy signal on the phone for about an hour, I managed to get placed on the waiting lists for all three days of the Memorial Day long weekend. The next day I lucked out – it appears that someone had cancelled and a 9.15pm spot had opened up for the Friday night. It would be a late night drive back, but there wasn’t any other option. Yountville is quaint and well manicured. As you stroll through the town in the evening, you see nice cars, diners in dressy attire that seems at odds with the casual countryside setting, and several attractive restaurants, including Bouchon (Thomas Keller’s more affordable eatery). 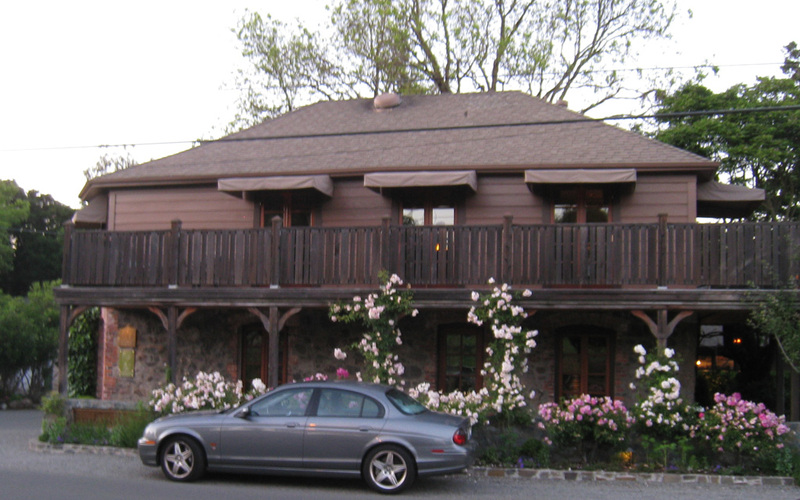 The Laundry is situated at the end of the main drag, in an old house which has variously served as a brothel, restaurant, and an eponymous French laundry over its 100 year old lifetime. Inside, its tables are split between two renovated floors. Although the tables are spaced tightly together, it does not feel cramped, nor do the other diners feel too close. However, it is still easy to eavesdrop on the discussions of your louder neighbours. The lighting is pleasing – soft and not dim – with a single candlelight adding some atmosphere on each table. The pleasant toilets fit one person at a time, and come with linen hand towels and the usual accoutrements. She returned after some time, and after reciting our selected menu top to bottom without flubbing anything, we were on our way. There’s not much to decide on the menu. It changes every day, but there’s always a “normal” menu and a vegetarian menu. Ten courses, three of them with internal choices. There are three additional complimentary plates – two appetizers, and one pre-dessert. The first main course is a constant: the signature Oysters & Pearls, which is also the first course at Per Se. It goes without saying that the food is top notch. As far as fine dining joints go, the menu doesn’t rely on a lot of funky ingredients or weird cooking techniques. The flavours are usually familiar, but are done super well. One of the stand out dishes was a fat, tasty scallop, cooked all the way through to perfection and slightly seared on the outside. There weren’t any weak dishes. 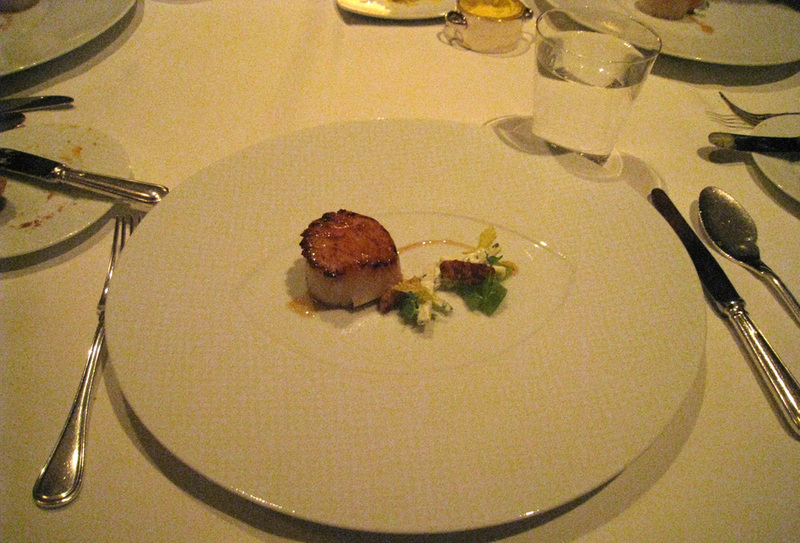 To me, the food seemed to be noticeably better than at Per Se. The service at this restaurant is without parallel. It was seamless and flawless. The army of waitstaff are dressed alike, including the women (I always thought that ties looked strange on women), and are drilled like an army. Periodically, a stream of four waitstaff would clomp past us to present the next course to the next table – a party of six – so that everyone would be served simultaneously. Pacing of courses is excellent and appropriately varied. They seemed to blend in well with the tempo of table conversation. They are super attentive. Water glasses were never empty, and when you walk away to the restrooms, they don’t just refold your napkin; they replace the entire thing. Details, details. My mum doesn’t like cheese, so when the cheese course came around, she had a nibble at one slice, and pushed the rest to the side. When the army came to collect the plates, one of the waiters noticed the leftover cheese and immediately turned to mum with an expression on his face that looked like we just told him that the family dog had just died. When mum told him that she didn’t like the dish, he offered to replace it with different cheeses. Another waitress in the meantime had caught wind of mum’s manifestation and materialised on the other side of her, a similar look of concern emblazoned on her face. Mum clarified that she didn’t like cheese in general (she’s lactose intolerant), and he offered to replace the course with something entirely different. At this point, I’m not sure whether he, or mum, was more embarrassed. After assuring them things were perfectly fine and that she didn’t need the course replaced, they apologised again and moved on. If there was anything to fault them on, it was that they were too starched and too formal. It was as if they were afraid that a sense of humour would cause them to blemish the atmosphere with an inadvertent faux pas. The next door table cracked a joke while their waitress was presenting a course and, while the table was raucous with laughter, she paused briefly and uncertainly, a nervous smile fleetingly dashing across her face, before ploughing on through the rest of her spiel as if nothing had happened. Now, I don’t know whether it was a coincidence, or if they have superhuman hearing, but I did remark at one point in the night to my parents that they seemed to be a bit too rigid. Soon after that, our waitress started to relax a little, cracking the odd joke here and there. By the time the mignardises/petit fours came, I was stuffed. We had all the chocolates boxed (including some really awesome choc-coated toasted macadamias), and they put them in a gift bag along with some shortbread. Unlike Per Se, where some chocolates mysteriously went missing between our table and the kitchen, the Laundry really did box everything for us. The wooden clothes peg which holds the napkin is their calling card, so diners are encouraged to take them home. They also presented us with a copy of the night’s menu in a folder which was an excellent touch (apparently Keller used to sign these personally, back in the day where he didn’t own so many restaurants). A copy of the bill was handwritten on an old-style laundry receipt tag – complete with tear off docket and string – which is also intended to serve as another memento of the meal. You’re never too old for a gift bag! 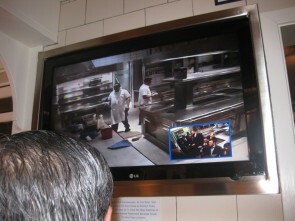 Finally, they offered us a tour of the kitchen. 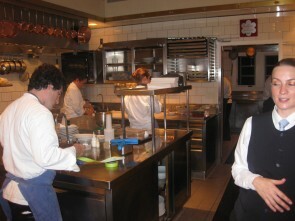 It was nearly 1am at that stage, and the kitchen was busy cleaning up. They actually have a large TV screen on one wall, on which they constantly stream a live video feed of Per Se, their sister restaurant in New York (it was almost 4am there and people were still cleaning up the kitchen). Although Per Se is meant to be on par with the Laundry, I would have to say that if you had to pick between the two, go to the latter. The text underneath the TV reads: When you acknowledge, as you must, that there is no such thing as perfect food, only the idea of it, then the real purpose of striving toward perfection becomes clear; to make people happy. That’s what cooking is all about. I recognise the oddity of a restaurant review in which only a couple of paragraphs are written about the food. But when you fork out this much dough for a meal, you’re not just paying for food – you’re paying for an experience. That’s why dinner there is at least a four hour affair. The quality of the food should be a given – but you also want to feel pampered. The French Laundry certainly gets that part right. And Michelin was spot on. $250 per person, plus CA state tax. Happily, tips are included in that price. Coffee/tea are complimentary. Other drinks are, of course, extra. There is a dress code (coats for men), which struck me as very un-Californian.